Stemming from the experience of blast wounds and shrapnel wounds from the Iraq war, advances have been made in the science of wound healing. 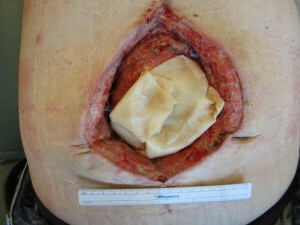 For years, complex or chronic wounds have been treated often unsuccessfully with a combination of techniques including gauze dressing changes, vacuum assisted devices (wound vac), surgical skin grafting, hyperbaric oxygen chamber emersion and other methods. In all these cases the wound healing takes a long period of time and involves inconvenience as well as cost and in some cases physical discomfort. In recent years many biomedical research laboratories have built upon the advances of cellular biology to develop graft materials that stimulate human tissue growth and wound healing. The category of product that the research laboratories developed is frequently referred to as extracellular matrix, or ECM. But not all ECM materials work the same. Researchers in laboratories examining tissue and wound healing have learned that extracellular matrix material can result in either scarring on the one hand, or more functional tissue regeneration on the other. The healthier and more functional regeneration of actual muscle tissue and other organ tissue depends on the stimulation of specific human growth factors and specific healing cells. M1 macrophages are believed to be highly important in the stimulation of functional tissue regeneration and in the recruitment of the progenitor cells that lead to site specific tissue regrowth, such as functional muscle. Other macrophage subtypes generally simply result in scar. MatriStem, the newest extracellular matrix, was created by a company called ACell and it was widely used in treating complex wounds from wartime injuries and led to remarkable results. Placed appropriately in wounds it stimulates M1 macrophages and brings specific growth factors to the tissue regeneration creating tissue specific functional healing. It markedly accelerates the time to healing. 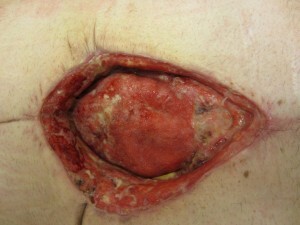 Advanced wound medicine sometimes involves employing a number of different techniques to achieve wound healing for chronic or challenging wounds. It often requires surgical debridement of the scar and additional surgery to achieve wound healing. It also requires regular follow-up with our clinical wound healing experts. If you are a patient in Reno who is in need of wound treatment candidates can set up an appointment with our doctors to learn more about our advanced healing therapy and regenerative medicine. Visit our contact page for appointments and questions. We are accepting patients from Carson City. Many patients struggle with wounds that are slow to heal or are considered “non-healing”. These wounds occur to tissues as a result of trauma, surgery or disease processes. 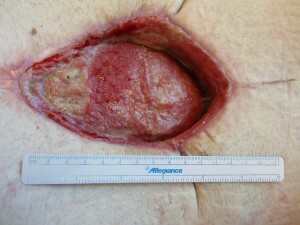 Over the decades, many techniques have been attempted to foster wound healing in these situations. Stemming from biomedical research efforts that focused on healing of wounds through tissue growth factors, a company called ACell developed a specific tissue growth stimulator that accelerates the healing of wounds. Much of the early research took place with complex wounds arising as a result of combat injuries in the Middle East over the last many years. Dr. Sasse saw some of these patients during his Air Force Reserve duties in the Washington D.C. area where he spent a small amount of time each year as a major in the Air Force Reserves working as an attending surgeon at the medical center at Andrews Air Force base. The biomedical researchers eventually developed highly potent growth matrices that would stimulate our own human tissues to regenerate and produce effective healing. Today MatriStem is an extracellular growth matrix material that is used in advanced regenerative wound healing centers. Dr. Sasse gained a great deal of expertise with complex and difficult wounds through exposure to many different situations in trauma, colorectal surgery, diabetes, and obesity medicine and surgery. The use of MatriStem by ACell involves placement of this material either in a powder form or in a sheet form at the time of surgery directly on an open wound bed. Over the course of a short period of time, the MatriStem product stimulates the human cells to regenerate and heal. Some of the most exciting aspects of this research are that this particular growth matrix recruits specific subtypes of macrophages that promote wound healing in an organized fashion rather than simple, disorganized scar tissue. Additionally, the specific properties of the extracellular matrix when added to wounds lead to what is called “type-specific” tissue growth. What this means is bone cells regenerate bone, and muscle cells regenerate muscle cells. Skin cells regenerate skin. They do not simply all converge to produce a disorganized, non-functional scar. Dr. Sasse and his team have performed hundreds of treatments of complex and non-healing wounds using MatriStem material by ACell. Shown here are photographs of some of these wounds and the remarkable healing that has been achieved. If you or your loved one is struggling with a non-healing wound, whether that is an abdominal wound, a soft tissue extremity wound, a non-healing diabetic ulcer, or another type, please contact the appointment desk to consider consultation regarding wound treatment with advanced regenerative tissue growth matrix. Download Summary: A controlled trial to evaluate effectiveness of MatriStem vs. standard of care. Complex wounds may arise from trauma, surgery, resection of tumors, ulcers from diabetes, and many other causes. Healing of complex wounds is impaired by factors such as diabetes, obesity, impaired arterial circulation, and immunosuppressive medications. The science of complex wound healing now includes the use of regenerative materials that have arisen from the research laboratory. Dr. Sasse and his team approach each wound care challenge on an individual basis with special care and individualized attention, using the best surgical and non-surgical techniques available to achieve healing. Below is an example of how Dr. Sasse and his team achieve complete wound healing rapidly in a complex, deep abdominal wound. In the first image, the open wound is treated with surgical debridement and placement of Matristem regenerative material. In the next image, 1 week later, the wound is re-inspected and more Matristem material is added in the office.